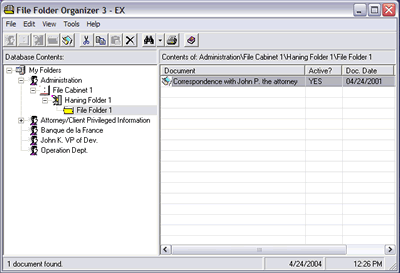 UDM Downloads > File Folder Organizer 3 - EX! Have you ever tried to locate an important document, searched for it everywhere and still cannot find it? If you want an organized and orderly filing system, then you need the File Folder Organizer. It is computer program that helps you organize and manage your paper documents that are stored in file cabinet. NO DOCUMENT SCANNING IS NEEDED OR REQUIRED. Rather than actually transferring the documents to your PC, the program allows you to maintain a database of the contents of your filing cabinets. Document titles for recipes, magazine articles, manuals, pamphlets, research papers, proposals, books, product information, client information, bills, blue prints and others are keyed into the program&apos;s database. Download and try a copy free for 30 days.